Witness true pride of ownership! Immaculate and just like new, with numerous upgrades , in this is a bright and spacious much preferred layout! Easy walk up to unit -- no long waits for the elevator! 1000 square feet with balcony of inspiring living space! Premium parking space with private door directly to locker right behind the parking. Highly desired Luna towers -- Escape from it all! Offers state of the art amenities! Rated 1 of the best infiniti pools in the city! Waterfalls & fountains, patios/terraces with BBQs & Cabanas surrounded by gardens in a breathtaking setting. Superb gym. Extremely managed! The low maintenance fees have never increased since new 3 years ago. 24 hour concierge & visitor parking. Attention Couples, young families, or siblings/friends who want to buy together! This suite is large enough with an exceptional layout that really works! Large open layout with dark stained quality wood laminate floors in the living/dining/kitchen is ideal for entertaining & dinner parties! Wall to wall windows fill the space with lots of natural light. Private balcony with sunny south views to relax on at the end of a long day. Sleek kitchen for cooking! Upgraded appliances, funky red backsplash , plenty of pot lighting, granite countertops , ample cupboard space plus a pantry! Master retreat has a large 4 piece ensuite. Ideal split floor plan for optimal privacy from the 2nd bedroom and large separate den. Marvelous combination of location, amenities & size offers outstanding value for downtown buyers. With a Walk Score of 95/100 the world is yours to discover on foot! Conveniently located just west of Spadina off Fort York Blvd! Take me out to the ballgame! With the Roger's Centre right at your doorstep your new pad is guaranteed to be a fan favourite with your friends and family. & The ACC (Air Canada Centre) hosts the hottest acts on stage plus the Raptors & our beloved Toronto Maple Leafs just a couple of blocks away. Just downstairs is a large Sobey's grocery store . You will love shopping & supporting the local farmers at the convenient Farmers Market available Mondays in the spring and summer month's 'right out your front door!" On the weekend walk north to Chinatown for authentic flavours and experience or east along Front St to the historic St. Lawrence Market . You'll be able to shop the 'European way' and buy fresh meats, fruits/veggies, tangy cheeses, fresh seafood, or the irresistible smells of freshly baked bread. Walk to work in the financial or entertainment districts, or the hospitals or City Hall. Go Green! This location is a Rider's Paradise with 13 nearby bus routes & 8 rail routes! Ditch your car and hop on a streetcar along Spadina, Bathurst and Harbourfront, or take the subway from Union Station or the GO train out of town. Bike or rollerblade along the Lakeshore Paths! Tons of bike & car share programs available to residents. Feel the need to get out of town? 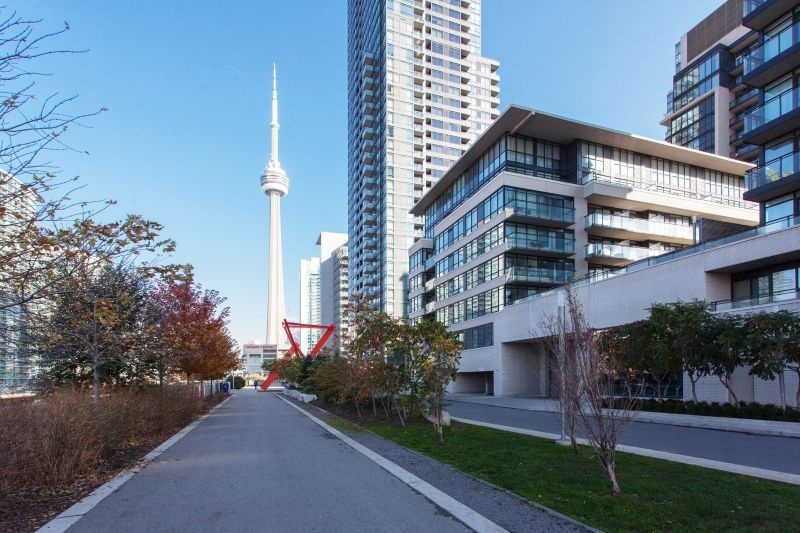 There is extremely easy access to the Gardiner Expressway, Lake Shore Boulevard and the Island Airport! Show your out of town guests the nearby CN Tower or TO's newest hot spot the Ripley's Aquarium of Canada located on Bremner Blvd. A thrilling adventure with over 16,000 aquatic animals, 450 different species, the world's largest jellyfish tank & a heart-pounding walk through the Dangerous Lagoon acrylic tunnel! Parks a Plenty! -- Clarence Square, Coronation Dog Park, Harbour Square Park, Isabella Valancy Park, Little Norway Park, Roundhouse Park, Lake Shore Park and Victoria Memorial Square to name but a few. Enjoy great local amenities including the Harbourfront, Queens Quay, Music Garden, Fort York, Toronto Islands & The Martin Goodman Trail. This 18 storey mid rise condo was completed in 2010 and built by Concord Adex. 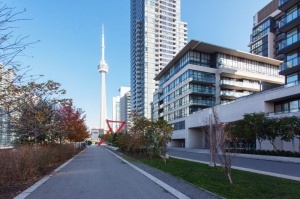 The Luna and Luna Vista complex encompasses two striking towers which are connected by a series of stunning amenities and share an astonishing terrace.Part of the iconic Concord CityPlace! The urban chic architecture and design reflect the new spirit of the downtown living experience, topped off with a series of lavish amenities that add to the convenience of living in a condominium community. Experience a series of fun activities & unique services including free fitness classes, complimentary movie nights, meal delivery service, personal trainers, massage therapists and house cleaning services. Rooftop salt water pool , whirlpool & patio, full fitness centre , theatre room, 24 hour concierge, His & Hers locker rooms include saunas & steam rooms, billiards room, 2 fully furnished guest suites, party/conference room, dance/yoga studio, internet cafe, cards/dining room. As a bonus there is an extensive amount of short term and long term underground visitor parking available for both towers, allowing your guests to visit with ease.